Los Angeles, California – Grab your popcorn, because the Equestria Girls are back for a magic-filled triple feature! There’s a reason these seven girls look familiar. . . as they step through a magical mirror, they transport from the world of My Little Pony, transforming into teenage girls at Canterlot High. Full-time students and part-time magical pony-girls, the Equestria Girls are always ready to save the day with the Magic of Friendship! 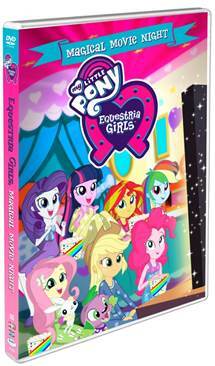 So, gather round for three mystical adventures when My Little Pony Equestria Girls – Magical Movie Night comes to DVD on August 8, 2017 from Shout! Kids in collaboration with Hasbro Studios. Pre-order is available now at Amazon.com and ShoutKids.com. Find this and more My Little PonyTM titles at ShoutKids.com.